UConn and Tennessee — with 19 national titles between them — have provided reliable and appreciated greatness. Their success has given women’s basketball groundbreaking visibility and legitimacy. 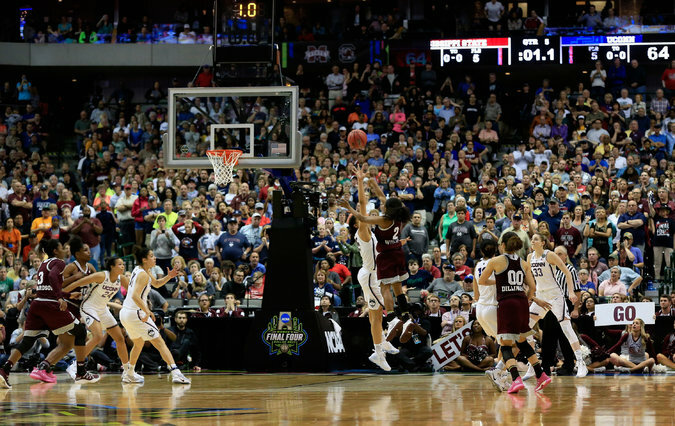 Mississippi State’s Morgan William, a 5-foot-5-inch point guard, making the winning shot in overtime. The Lady Bulldogs will face South Carolina for the title. And now the sport has another luminous moment that many observers felt it needed: not certainty but mystery. A surprise ending, a last-second revelation, a champion dethroned. A stunning instant that will be replayed for as long as games are won in a final astonishment. A woman hitting a late shot and her face blooming in jubilant disbelief and her teammates engulfing her in an ecstatic pile. “I think the fun of the men’s game is the parity, and the fun of the N.C.A.A. tournament is the upsets,” said Muffet McGraw, the longtime women’s coach at Notre Dame, which won the 2001 N.C.A.A. title and reached the final in four of the previous six seasons. Can you really blame Charles Oakley for being disgusted with dysfunctional Knicks? Run. Eat a Doughnut. Run.